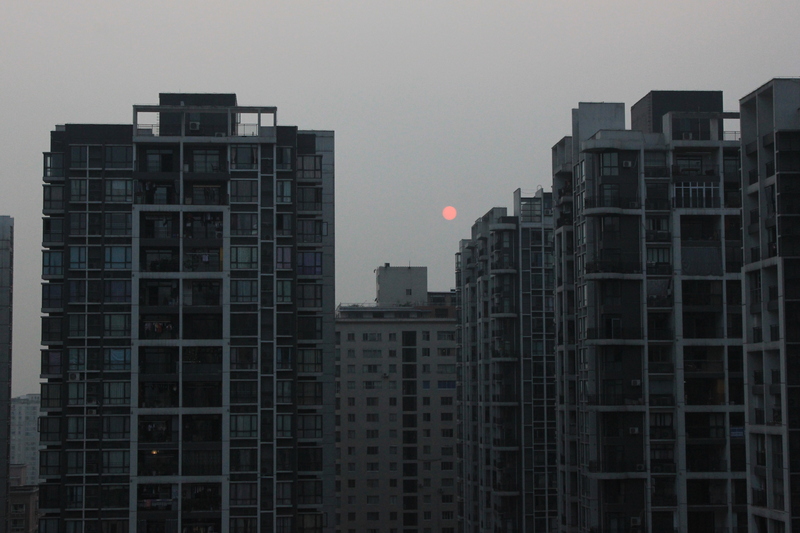 According to the guidebook, the Sichuan region is famous for spicy food cooked with Sichuan pepper. This special pepper numbs your mouth instead of burning it. It’s not for everyone, but we love it. 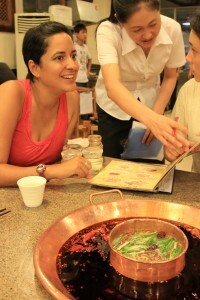 Chongqing is the Sichuan hot pot capital of the world. 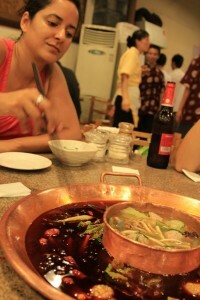 We have a Sichuan restaurant at home, but we’d never had hot pot. 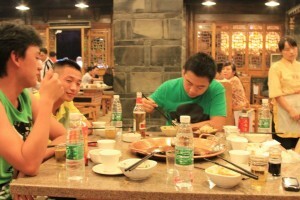 When we arrived we put discovering hot pot at the top of list. 1. 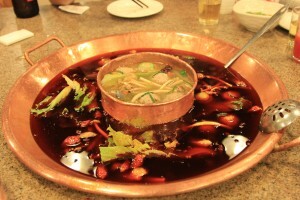 Order a giant cauldron of super oily, spicy and spice-filled broth. Giant cauldron of broth aka "Hot Pot". This one actually had two kinds of broths. 2. Select ingredients to put in broth – meat, seafood and vegetables. Guessing may be required. Sasha picked our ingredients from a menu here, but we also picked them out of refrigerated cases on other occasions. 3. Make personal spice concoction for dipping that includes sesame oil, cilantro, garlic, etc. and, of course, more pepper. 4. Let ingredients from Step 2 cook in cauldron from Step 1. 5. Remove cooked ingredients from pot and, if you want, dip them in water to remove the oil, then dip them in your personal spice concoction. Sasha getting items from the hot pot. It’s quite a process and, even for spice lovers like Sasha and I, it packed a punch. The more people taking part the better. We tried it a few times and enjoyed our meals, but in the end we found it a little too oily for our tastes. We also couldn’t help but think our arteries might not stay clear through the morning.